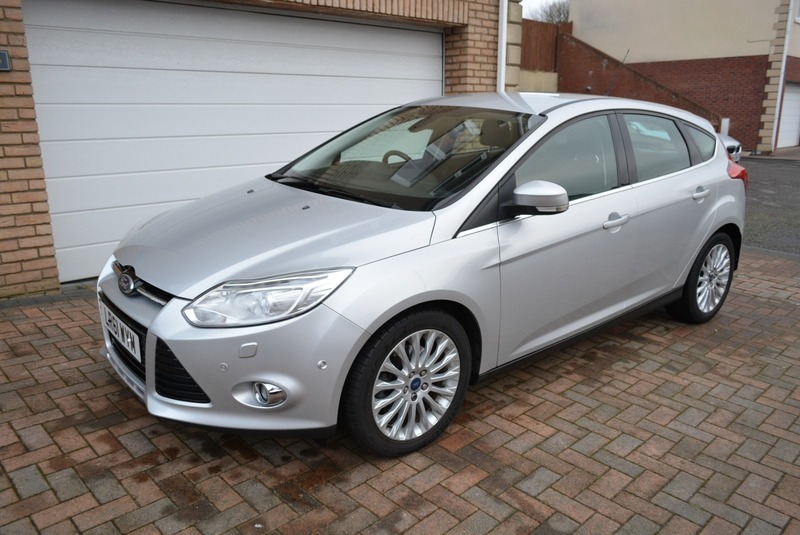 2011 (61) FORD FOCUS 1.6 TURBO SCTi EcoBoost TITANIUM X 5dr HATCHBACK. MOONDUST METALLIC SILVER WITH BLACK PART LEATHER UPHOLSTERY. 1 OWNER FROM NEW WITH FULL FORD SERVICE HISTORY (7 SERVICES WITH SAME MAIN FORD SERVICE CENTRE). LAST SERVICED ON 26-09-2018 AT 67,983 MILES. NOW SHOWING 69,020 MILES (SO JUST 1,037 MILES SINCE THAT LAST SERVICE). MOT UNTIL 27-09-2019. ( WITH NO ADVISORIES) THIS CAR HAS BEEN VERY WELL LOOKED AFTER BY THE ONE AND ONLY OWNER. IT IS IN EXCELLENT CONDITION. THIS IS A TOP SPEC CAR WITH MANY FINE FEATURES, INCLUDING--1/2 LEATHER SEATS--10 WAY DRIVER + 4 WAY PASSENGER FRONT ELECTRIC ADJUSTABLE SEATS--ELECTRIC HEATED FOLDING DOOR MIRRORS--CRUISE CONTROL WITH SPEED LIMITER--DUAL AUTO TEMP CONTROL AIR CONDITIONING--HEATED REAR WINDOW--FRONT AND REAR PARKING SENSORS--PARK PILOT--FRONT FOG LIGHTS--LED DAYTIME DRIVING LIGHTS--IMMOBILISER-PASSIVE ANTI THEFT SYSTEM--PRESS BUTTON-KEYLESS START--6 SPEED MANUAL GEARBOX--ESP + TRACTION CONTROL--DAB DIGITAL RADIO + CD--BLUETOOTH--UNUSED NEW SPARE WHEEL--17" ALLOYS--METALLIC PAINT + A LOT MORE.